Grade 932 Bearing Bronze is a high leaded tin bronze alloy. This bronze alloy is known for its excellent strength combined with excellent anti-friction qualities that make it very resistant to wear. This combination is how 932 has come to be known as "Bearing Bronze" because it is often an ideal choice for bearing applications. It should be noted that Grade 932, 954, and 959 bronze are continuous cast bronze products. This means they are are cast over-sized to allow for finish machining. 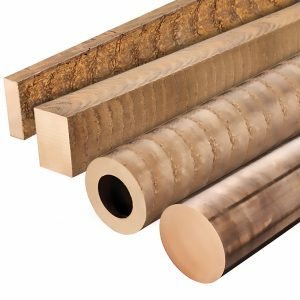 932 bronze also has an electrical rating of 12% that of copper. 932 bearing bronze is commonly found in industrial, automotive, appliance, aerospace, and any bearing and bushing applications having medium loads and speeds with adequate lubrication.